Born April 29, 1886 in Evergreen, Colorado, details about the early life and educational background of Harold Horatio Ginnold are unknown. However by the age of 16, Ginnold had moved to Seattle and began serving as a draftsman in the architectural offices of James Schack (1902-1906). In 1907 he worked for architect Harlan Thomas, one of the foremost architects in the city. Then in 1910, Ginnold acquired half interest in the architectural firm of C. Lewis Wilson & Co. (1910-1913). While many details about the firm are unknown, the company had many large commissions and maintained offices in Seattle and Chehalis. Known projects by the firm include the Pacific County Courthouse (1911) in South Bend, the Franklin County Courthouse (1913) in Pasco, and several Carnegie Libraries: Pasco (1911), Port Townsend (1913), and Renton (1914). For reasons unknown in 1914, Ginnold (then age 28) opened his own independent firm in Seattle. His first independent project may have been the Kuppler Building (1914) on Laurel Street in Port Angeles. Several additional buildings in Port Angeles followed incuding a $100,000 contract from the School District in 1922 to design several new schools and a variety of additions. Projects included Washington School (1922); Jefferson School (1922), and an addition to Lincoln Heights School (1922). He also designed new schools in the small communities of Blyn (1916), Beaver (1916), Forks (1916) and Joyce (1922). Ginnold’s connection to Port Angeles may have been through his wife’s (Hypatia Dermal) family. Marie Dermal, Ginnold’s mother-in-law, was a prominent, early pioneer of the city and was a charter member of the Literary Club, forerunner of the Port Angeles Library Association. Ginnold had married Hypatia Dermul in Port Angeles on September 18, 1907. He was well known in the city of Port Angeles and also designed the Naval Order of the Elks Lodge #353 in downtown Port Angeles (1916), and the Carneigie Library (1918). In 1919 Ginnold applied for and received his State architectural license (No. 59, Dec 13, 1919), one of several hundred architects who were grandfathered in before the new licensing testing requirements took effect. He continued working from Seattle for the next 10+ years. Projects in Seattle include alterations to the 1530 Westlake Building (1923) for Mr. C.C. Asker; the Herzig Building (1927); the Devo Apartments (1928); the Rudolph Thorlakson House (1928); the Graybar Electric Co. Building (1929); and a first floor remodel of the Frink Building (c. 1932). In 1933, Ginnold closed his independent architectural practice and went to work for the U.S. Army, serving as their in-house Architect/Engineer in the Construction Quartermasters office at Fort Lewis (1933 to 1946). Designs on the base attributed to Ginnold include the Jensen Gym (1934); the Georgian Revival style Post Headquarters Building (1935); and the Arts & Crafts inspired Fort Lewis Logistics Center Entry Gate (1945). Over his thirteen year stint on the base, he served in various capacities; from architect to principal engineer and worked with the Civilian Conservation Corps (CCC) during the late 1930s (1933-1938). 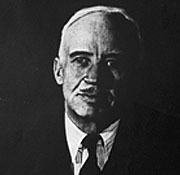 Ginnold left Washington State in 1946 and took a position as Chief of Construction Services for the Veteran’s Administration in their San Francisco branch office. Project during this pahse of his career are unknown. He died in San Mateo County, California on June 14, 1959.